But of course, no birthday gastronomic rendezvous is complete until a proper family dinner. After positive reviews, we made our birthday dinner reservation for YEN Restaurant on the 31st floor of the W Hotel. Boasting an amazing skyline view of Taipei, we were extremely excited to have some high quality Asian cuisine. From YEN’s extensive wine list, we chose a nice bottle of Italian Castiglioni and paired it with a variety of seafood and red meat. Of the various dishes we tried, my Dad really enjoyed YEN’s fried King Prawns, which were nicely spiced and topped with crisp lotus roots. My Mom found the diced Wagyu steak with asparagus to be perfect with the Chianti. But I think, my personal favorite had to be the savory ‘3 Cups’ Braised Cod–the ‘3 cups’ referring to rice wine, soya sauce, and sesame oil that is used to create the classic Chinese dish. Overall, YEN was a definitely a phenomenal wine and dine affair–we really enjoyed ourselves! Especially since the trendy restaurant was well spaced out and quiet, a pleasant change of pace from the hustle and bustle of the hotel’s popular Woobar downstairs. So if you’re ever in Taipei looking for a special-occasion restaurant, stop by YEN for a nice meal and soak in Taipei’s skyline. 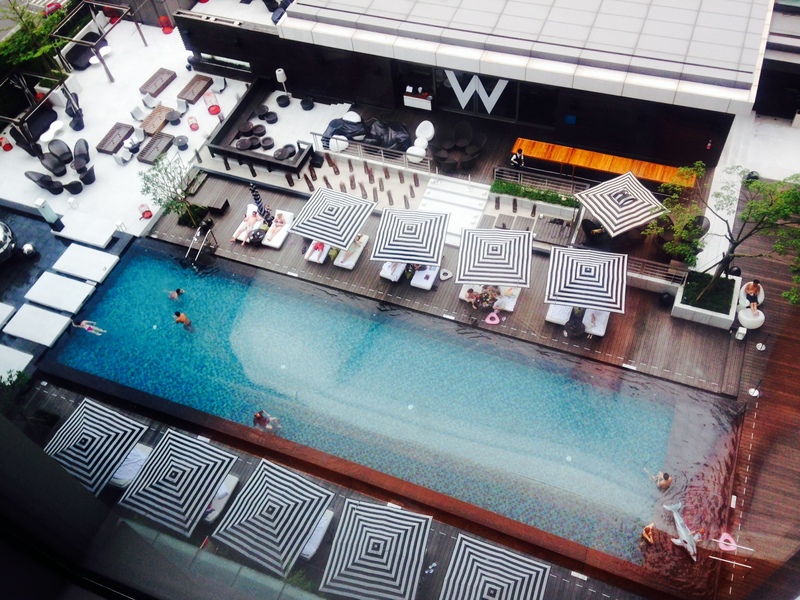 The W Hotel was also centrally located and perfect for weekend getaways and shoppers looking to do some damage in Taipei’s popular Xinyi area! And last but certainly not least, Happy Birthday Dad! Thank you for inspiring me with your actions, and challenging me to be a more passionate and driven person everyday. Happy Birthday to my dearest Dad! P.S.- As I just arrived in Tokyo for the summer, watch out for my new food adventures in another delicious city! I absolutely cannot wait. Thank you! I absolutely cannot wait to try everything, all the restaurants I’ve walked past look quaint and magical! Wow. Your meal looks divine. Crisp lotus! A favorite of mine. In Tokyo, have you been to Casita? Crisp lotus was on point indeed! No I haven’t been yet, would you recommend it? Sorry about the delay getting back to you! I hope Tokyo is treating you well. 😀 Yes. We went to the Hilltop location. Hubby booked the private room for my birthday. We had outstanding service and were continually surprised throughout the meal and after with amazing touches. I felt like a queen! We haven’t been back for so long but our friends go to the Ikebukuo location for their anniversary every year. Previous PostSaying Goodbye to London at the Riding House Café!